I was very excited to visit Rocky Mountain National Park a few weekends ago, and to realize that it is now *almost* in my backyard -- just an hour's drive from where I live! We arrived by taking the Peak to Peak Scenic Highway (see that post on this link) and we stayed two nights right outside the park in a cabin in the YMCA of the Rockies in Estes Park Center (see that post on this link) Please remember that all photos in this post will enlarge for easier viewing, if clicked on once, and then clicked on again to see them full size. Rocky Mountain National Park is located in northern Colorado and encompasses an area of 416 square miles (265,769 acres). Among its special features are beautiful mountain vistas, as 114 mountain peaks are above 10,00 feet high, 60 are above 12,000 feet and Longs Peak is at 14,259 feet! The park is full of 300 miles of hiking trails, numerous campsites, meadows, and subalpine and alpine vistas, lakes and creeks, thousands of varieties of wild flowers and plants, and chances to see wild animals. 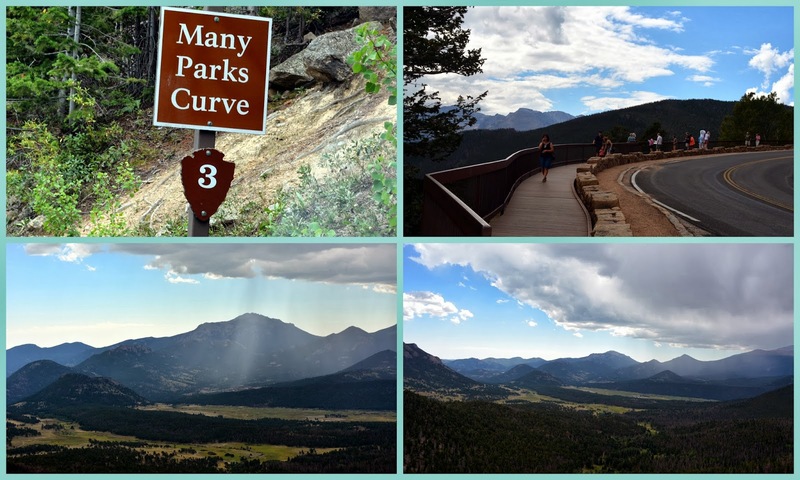 Rocky Mountain National Park attracts more than three million visitors a year! We entered the park at the eastern entrance, located on Highway 35, which is 3.5 miles west of Estes Park. Now that my husband is over 62 years of age, he was able to buy a lifetime senior pass at the entrance station, that enables him (and up to three other people riding in his car, no matter what their age) free lifetime admission to any national park in the USA! Our first stop in the park was at the Beaver Meadows Visitor Center, one mile west of the entrance. 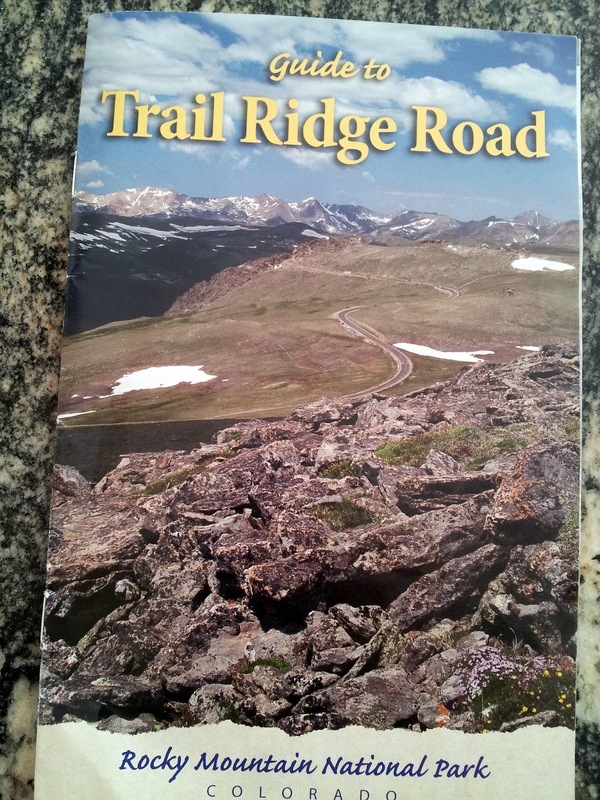 There we purchased the wonderful pamphlet that you see above-called Guide to Trail Ridge Road, which I highly recommend, as it greatly increased our appreciation for all we were about to see while driving on the Trail Ridge Road. All the special interest stops along Trail Ridge Road are numbered "arrowheads" as you see on the bottom of the sign above, and the pamphlet gave uninteresting information about each point. Trail Ridge Road (US 34) is the highest continuous paved highway in the United States! Covering 48 miles between Estes Park on the east and Grand Lake on the west. Eleven miles of this highway travels above the treeline at elevations near 11,500 feet! It then winds along the tundra to a high point at 12,183 feet! When driving on this road it is hard not to feel as if one is on top of the world! For every 1,000 feet in elevation gained on the road the temperature drops between 3 to 5 degrees Fahrenheit, as if you had driven 600 miles north! Trail Ridge Road was opened in 1932, paved by 1940, and is very well maintained. It is an engineering feat that was built to be a gentle ride both is ascent and descent so that you never have to fear the heights you will attain on it. At scenic point one, along the Trail Ridge Road, was "Deer Ridge Junction." at 8,940 feet elevation. The road follows a route once used by the Ute and Arapaho Indians, as well as earlier prehistoric people. The lower elevations favor open meadows inter-spaced with strands of ponderosa pines. These broad-crowned trees have a thick, reddish bark that smells like vanilla in the summer. We were amused to be stopped at one point by a rafter of wild turkeys that leisurely took their time crossing in front of us on the road! Trail Ridge Road scenic stop number two, is "Hidden Valley," a former ski downhill ski area, at 9,240 feet elevation. Hidden Valley is today a year-round recreational site offering picnicking, hiking, and winter activities. In winter the snow often lies several feet deep here, and the summers are cool. Subalpine forests of Engelmann spruce and subalpine fir trees live here. Next stop was stop number 3, "Many Parks Curve," elevation 9, 620 feet. This stop had a grand panorama of many mountain enclosed meadows, and moraines. Moraines are great heaps of rock debris that glaciers pushed or deposited along their sides between 150,000 and 12,000 years ago. At this vantage point, we could also see multiple rain showers occurring in the distance! Excuse the windshield window glare in this photo, but I had to include it in this post, as I wish I could describe the delicious smell of all the pine trees we passed in this corridor along the road. I wish I could find a perfume that smelled as good! It was so intoxicating! As we approached the next stop we passed this sign that announced we were two miles above sea level at 10,560 feet! There were lots of curves in the road as we ascended higher, but again the Trail Ridge Road is smooth and wide and did not feel dangerous to drive at all. Stop number four is "Rainbow Curve," at 10,829 feet elevation. 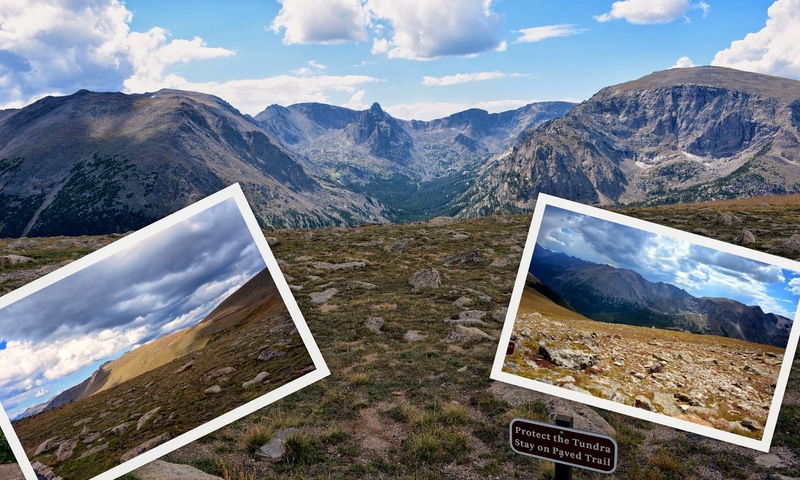 You can see portions of the Trail Ridge Road, Hidden Valley and Horseshoe Park in these photos. The Fall River flows through Horseshoe Park. The little chipmunk jumped right up on the rock ledge before me, begging for a handout, but I obeyed the park rules and did not give him any food. A close up of the alluvial fan of rubble that lies in Horseshoe Park, which can be seen well from this vantage point. The alluvial fan was created by past flood waters that deposited this debris in a matter of hours when a man made an earthen dam at Lawn Lake gave way during the early morning of July 15, 1982. The raging waters deposited boulders, gravel, and sand onto the floor of Horseshoe Park in a rocky layer 44 feet deep! Sadly, this flood killed three people camping in the park that day. You can read the story about this natural disaster on this link. This area also suffered damage from the recent heavy rainfall and flooding and some of the campgrounds had to be closed for repair. ...the scenery became more and more spellbinding! We were leaving the sub-alpine area and entering the alpine section above the tree line! The next scenic stop was "Forest Canyon Overlook," at 11,716 feet. The stick markers you see along the roadside are there to show snow plow drivers where the road ends when the high snows fall in winter. Here we had a splendid panorama of Forest Canyon, Hayden Gorge, and Gorge Lakes. The erosive force of glacial ice can be observed in the valley below. This is also a tundra protected area, where the public is asked to stay on marked trails to preserve the fragile tundra. The word tundra is a Russian word that means "land of no trees." Here wind speed can be over 100 miles an hour, and temperatures remain below freezing at least five months of the year. Because of these harsh conditions and short growing season, tundra plant communities take centuries to form. It would take decades to repair the damage that footsteps would do to them! Since this post is already long, and I have much more to show you, I will save the rest of my photos of Trail Ridge Road for part two and three, as we have many more beautiful stops ahead. You won't want to miss seeing the next stop, which is part of the "Roof of the Rockies"! There we met some more wild animals and I walked a spectacular tundra trail with sights that are out of this world! 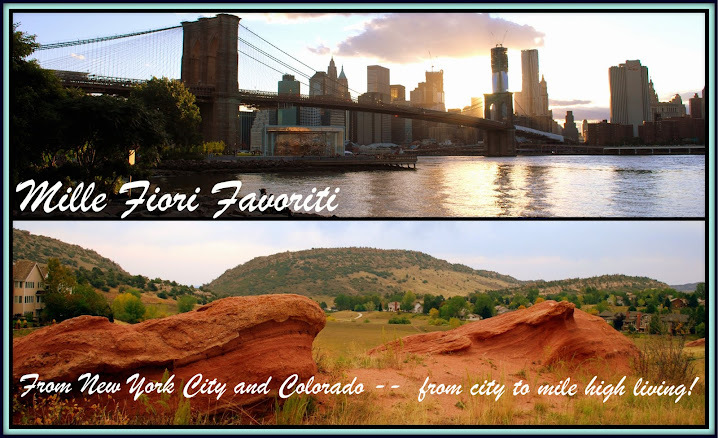 Please join me again next post as I know you will enjoy it as much as I am enjoying showing this magnificent park to you! 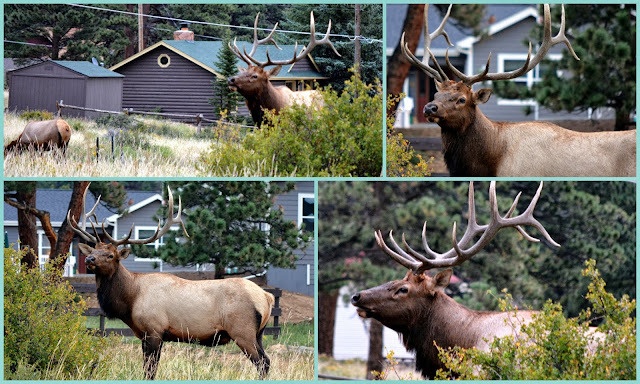 When my husband and I decided to take a spur of the moment trip to Rocky Mountain National Park, during the first week of September, we knew we might have difficulty making reservations at a motel or hotel in the closest town to the eastern entrance to the park, which is Estes Park. 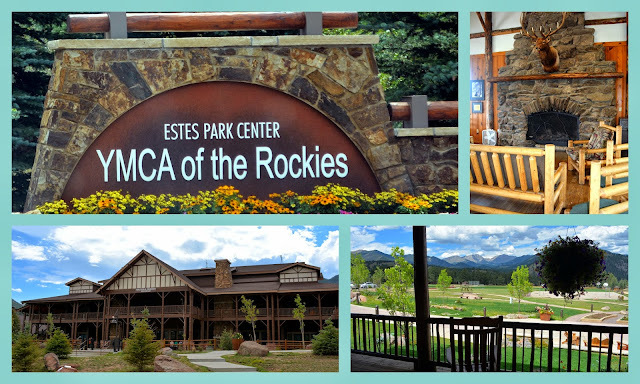 Then we remembered that our son and daughter-in-law and two grandsons enjoyed a nice vacation at the YMCA of the Rockies in the Estes Park Center this summer, and luckily when we checked there was still some accommodations available for the days we wanted to visit! 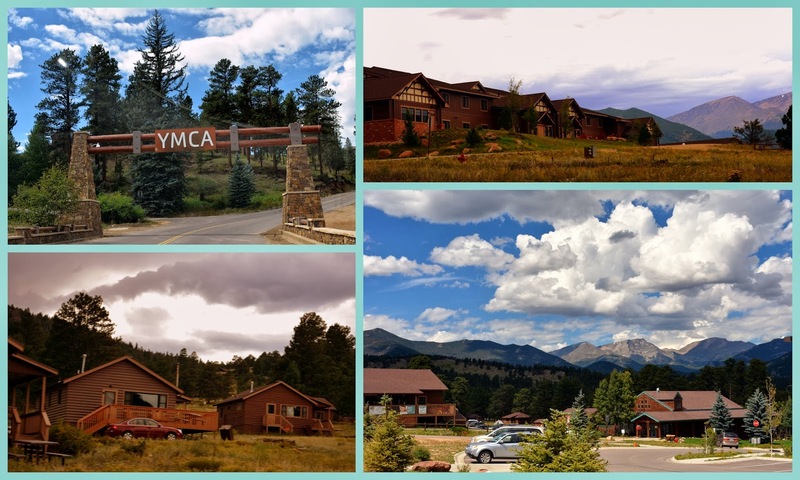 The YMCA of the Rockies has a large number of different styles of affordable accommodations available year round, and it is a wonderful place for families to stay, as there are many activities on the grounds for children, teens, and their parents. 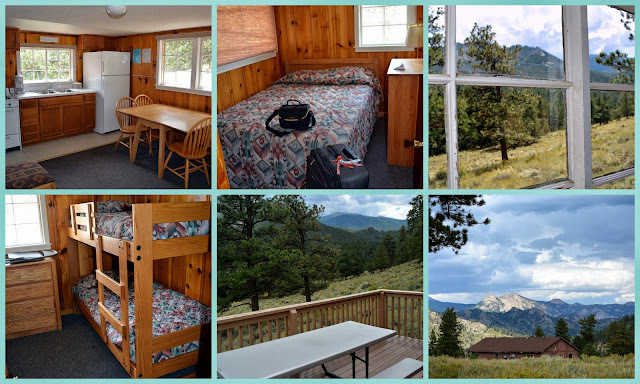 As we primarily just wanted a place to stay before and after driving through the Rocky Mountain National Park for a few days, we decided to lodge in a cabin. Cabins have gas or electric heat, fully equipped kitchens with a stove with an oven a refrigerator and a microwave (except the two bedrooms basic cabin), telephones, and one or more bathrooms. Linens, bath and dish towels, dishes and cooking utensils are provided. Cabins do not have TVs. TV's are only available in the vacation homes, which also have a microwave and dishwasher. We found the accommodations rustic, but perfect for our needs, and the setting was beautiful! A view of the YMCA athletic field, and in the distance is the "Mummy Range" so named as a portion of the top resembles an Egyptian mummy lying on it's back -- can you see it? We went into the pretty town of Estes Park for dinner a couple of evenings. 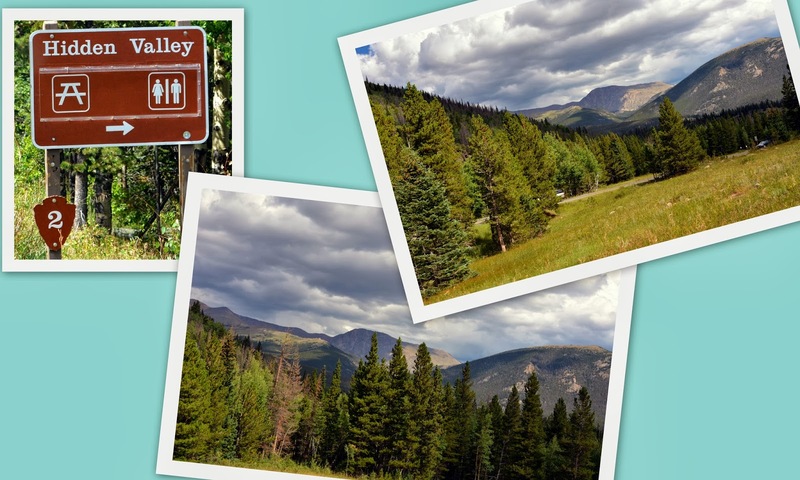 As you might know, the town and some of Rocky Mountain National Park campgrounds were flooded after the terrible rain storms last week, but they have both worked hard to clean up and are back in business again! One evening, as we drove into town, we saw this surprising sight in a traffic median! It was a gorgeous, and gigantic, elk bull! Elk are also called wapiti -- a Native American word that means "light-colored deer." Elk are related to deer but are much larger than most of their relatives. A bull elk's antlers may reach four feet (1.2 meters) above its head so that the animal towers 9 feet (2.7 meters) tall! I made sure I stayed quite a distance away from this elk, as he was with his herd of females, and he bugled his warning a few times. 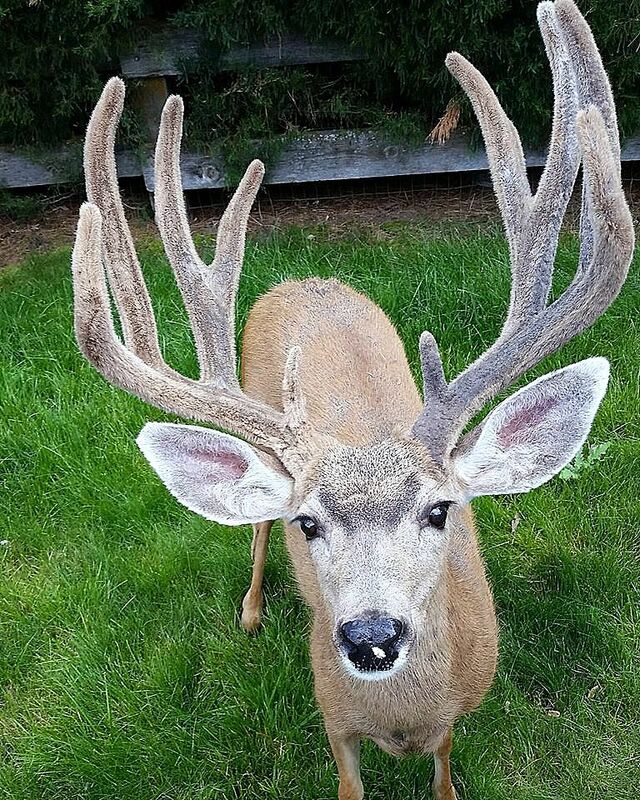 Bull elks make this bugle sound when they are in the rut. By bugling, he announces his fitness to cow (female) elks and warns other bulls to stay away. 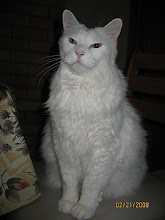 It also announces his readiness to fight. f you'd like to hear what a bull elk's bugle sounds like you can watch the Youtube above, or at this link. This was a sound we were going to hear quite a bit over the next few days! As naturalist John Muir once said: "The mountains are calling and I must go." As soon as we settled into our cabin in the YMCA we headed out to Rocky Mountain National Park. 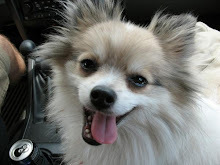 More about our adventures there in my next few posts! Last weekend my husband and I took an exhilarating road trip along the beautiful "Peak to Peak" highway in Colorado. This scenic and historic 55-mile highway was established in 1918 and is Colorado's oldest scenic highway. It provides magnificent views of the Continental Divide, national forests, wilderness, and nature preserves. 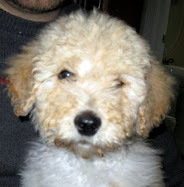 If you click on this (and every photo in this post) it will enlarge. Then click on it again for easier viewing of the entire Peak to Peak Highway route and the towns it passes through or by. Double enlarge this photo of a roadside placard that tells the story of the Peak To Peak Highway. We joined the highway in the town of Blackhawk. Blackhawk was once a mining town outside Central City, and now both towns are known for their casinos. Once we hit the open road we could see the Rockies peaks in the distance. The weather up to this summer weekend has been hot and dry, and all the mountains were free of snow. We wondered if we were going to see any autumnal color change during our drive? ....and we saw many peaceful valleys. When we approached this interesting building near the town of Allenspark, we pulled over to see what it was. We turned into the Saint Malo Center and learned there was once a retreat center on this property which was almost completely destroyed by a fire a few years ago. Mount Meeker looms in the distance. 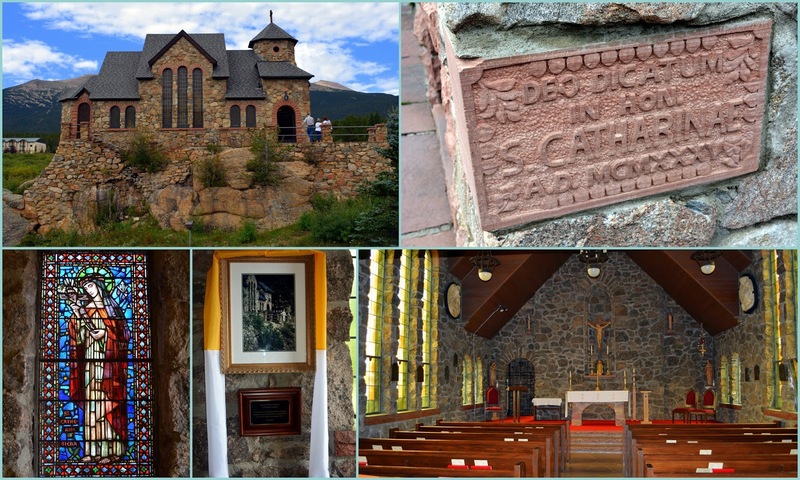 This charming little church is visited by thousands who see it on their ride on the Peak to Peak Highway. It was also visited by Pope John Paul when he stayed at the Saint Malo Retreat Center during his visit for World Youth Day in Denver in 1993. He blessed the chapel and later hiked in the surrounding woods. An inspirational plaque that was on the wall inside the chapel. We stopped again on the Peak to Peak Highway to enjoy this view of Longs Peak. There it stands at 14,256 feet! Colorado has 54 mountains that are over 14,000 feet, more than any other state in the union. ...and we knew we were getting close to our destination! We ended the Peak to Peak Highway trip in Estes Park and drove to where we were going to stay for the next few days, the YMCA of the Rockies! More about our stay and our visit to Rocky Mountain National Park on my next blog post. * Epilogue: As I wrote in my last blog post, my family is, fortunately, safe and sound, despite the record-breaking and devastating rainfall that the entire Front Range of Colorado has received this past week. 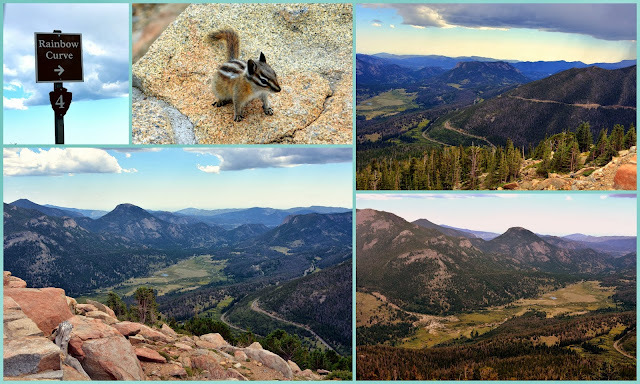 I had tears in my eyes as I looked at the photos I took of this trip along the Peak to Peak Highway and our visit to Rocky Mountain National Park, as I knew many of these areas were severely affected by the storms. 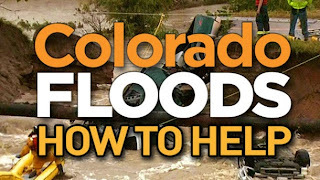 An area the size of the state of Connecticut has been severely flooded in Colorado and there has been a devastating loss of life and property. Major roads and bridges have been destroyed by all the rushing flood waters, and helicopter rescues by the National Guard have taken place in many mountain communities that have been cut off from civilization. This is being now called a rare natural disaster that occurs at most, every 500 years! The entire depth of the aftermath of this epic storm is still to be seen. Estes Park has begun to clean up, and I know the resilient and resourceful people of Colorado will come together to repair and rebuild all that has been destroyed. Please keep those affected by the floods in your prayers, and know that the beauty of much of Colorado remains, and what was damaged will be restored. I love my new state, and I know it will be able to recover! The CBS Denver webs site --click here--lists ways to help the people of Colorado who have been devastated by this catastrophic flood! An estimated 19,000 homes have been lost or damaged, 12,000 people have been evacuated and over twelve hundred people are reported missing!